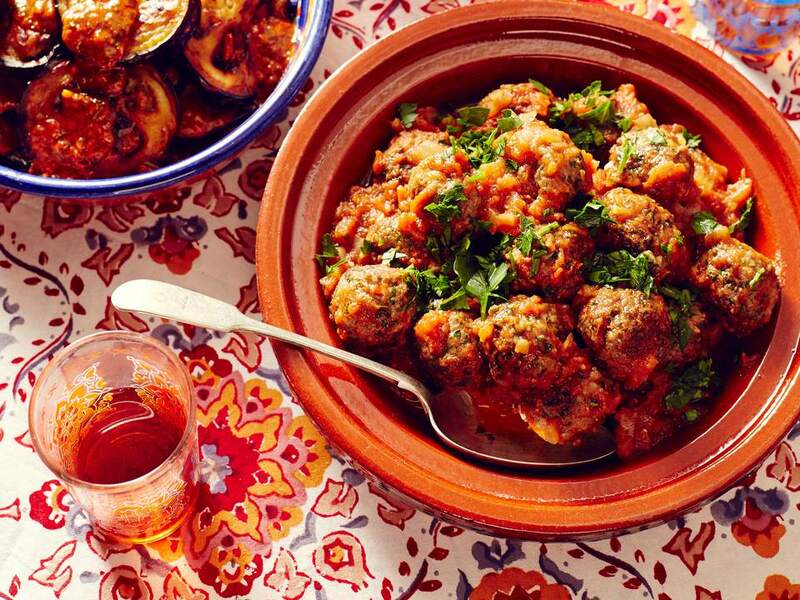 A favorite of children and adults alike, kefta mkaouara (or Mmawra) is a presentation of petite, cherry-sized meatballs in a zesty homemade tomato sauce. Traditionally this famous Moroccan dish is prepared in a tagine, which lends earthy flavor, but a deep, wide skillet or Dutch oven will work just fine. Eggs are often added to the dish at the end of cooking; they're allowed to poach just until the whites set. The final presentation is comfort food that begs you to dip right on in with crusty Moroccan bread. The well-seasoned meatballs are easy to make, but a set of extra hands will make shorter work of this step. Plan to start simmering the sauce while you shape with the kefta, which can be made from ground lamb, ground beef, or a combination of the two. An egg is not traditionally used as a binder, but if your meat is extra lean, go ahead and use one. Likewise, breadcrumbs are not normally used as a filler, but if you prefer softer, spongier texture to your meatballs, a half cup or so may be added. Some versions of kefta mkaouara include onions and a little green pepper in the tomato sauce; whether or not to include them is up to you. Note: while there are multiple steps to this recipe, this kefta dish is broken down into workable categories to help you better plan for preparation and cooking. Peel, seed, and chop the tomatoes or if they're very ripe, cut the tomatoes in half, seed them, and grate them. Mix the tomatoes with 1 medium onion chopped finely (if using), paprika, cumin, salt, black pepper, parsley, cilantro, garlic, olive oil, and bay leaf in the base of a tagine or in a large, deep skillet. Once simmering, reduce the heat a bit and allow the sauce to simmer gently, at least 15 to 20 minutes but longer if you like, before adding the meatballs. Combine the ground beef or lamb, onion, green pepper, paprika, cumin, salt, ground cinnamon, black pepper, cayenne pepper, parsley, and cilantro. Using your hands to knead in the spices and herbs, shape the kefta mixture into very small meatballs the size of large cherries—about 3/4-inch in diameter. Add the meatballs (and chili peppers, if using) to the tomato sauce, along with a little water—1/4 cup is usually sufficient—and cover. Cook for about 30 to 40 minutes, or until the sauce is thick. Add the eggs to the tagine without breaking the yolks. Cover and cook for an additional 7 to 10 minutes, or until the egg whites are solid and the yolks are only partially set. Garnish if desired with fresh parsley or cilantro, and serve immediately. Enjoy! Kefta mkaouara is traditionally served from the same dish in which it was prepared, with each person using crusty Moroccan bread for scooping up the meatballs from his own side of the dish.